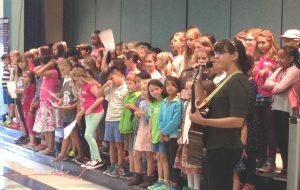 Ms. French, right, leads the choir during an Assembly. Any Thurgood Marshall student in Grades 2-5 may sign up for the Choir, an extra-curricular experience supported by the school and the PTA. Why: Music Teacher Kelsey French says: “Join us, and develop musical skills, teamwork skills, and confidence!” Students will have opportunities to sing at concerts, assemblies and community events. When: Unlike most before-school activities, Choir operates for the entire school year. It will meet during one morning per week, and will perform at the school and possibly elsewhere in Seattle. In 2017-18, Choir Concerts at TM were 7 p.m. Feb. 15 and 7 p.m. June 7. Enrolling: You MUST register your child. Online registration will occur through our Enrichment Program. Students previously enrolled must fill out a new form each year. A small fee is charged, but scholarships are available, supported by donations to the PTA.